I’m back today with some close-up shots of the new Quilt-Along quilt, Hazel’s Summer Wildflowers (or Hazel Ilene’s Veritable Rubicon of Wildflowers, if you’re going with that moniker). I still need to get some better shots of the quilt full out, but to get you started, I thought I’d show you some close-ups of the stitchery, and tell you how the quilt-along is going to work, and what your options are. I’ll also give you yardage information, so you can start thinking about what you’d like to make your quilt out of, start digging through your stash, or plan that oh-so-necessary shopping trip! The finished quilt measures 61″ x 78″. There are 6 pieced blocks, all alike . . .
. . . and 6 embroidered blocks, each one different. For the embroidery on my quilt, I used lots of different stitches and fills, just so it would look more filled in and “fancy” (for lack of a better word). HOWEVER — I’m also providing instruction for a simpler version of the block, and will be showing you those as well. You can choose to do the “regular” version, or the “fancy” version, just depending on how much time you want to spend, and how well you like to do embroidery, or whatever you desire to fit in with your own plan for this quilt. We’ll start with the embroidered blocks, and work through them 1 through 6. About every 3-4 weeks, I’ll post the next block, and at the end, we’ll do the pieced block, and I’ll post assembly instructions last. You should have a finished quilt top before the end of the year this way. Along with the block pattern, I’ll show you the regular version and the fancy version, PLUS a bonus project using the regular version (since you’re seeing the fancy ones in the quilt). 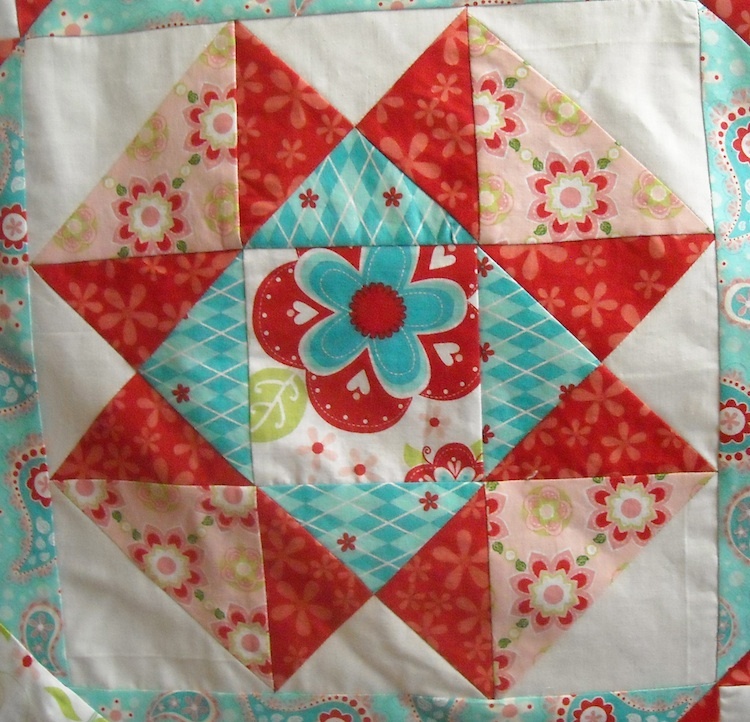 This will give you some ideas and other projects you can do in case you don’t want to do the entire quilt. If you simply don’t like embroidery at all, then you can check back in toward the end of the Quilt-Along, and use the instructions for the pieced block to make your entire quilt just from the pieced blocks instead of putting in the embroidery blocks. For my sample quilt, I used pieces from the Sugar & Spice line by Amanda Herring of the Quilted Fish for Riley Blake. I then chose my embroidery floss colors to match my fabrics. You’ll also need 4 yards of regular yardage for the backing when the time comes, or if you’re using wide backing, only 2 yards. For the embroidery floss, I can’t state exactly how much you’ll need, because it depends on how you stitch, and how many colors you decide to use, etc. For mine, I used 8 different colors: 2 greens, 2 pinks, 2 reds, 2 blues. If you do your embroidery exactly like mine, using 3 strands of floss, you’ll need 3-4 skeins of each color, and at least one extra of each green. You’ll also probably want an embroidery hoop to make the stitching easier. I used a 6″ plastic hoop for mine. In addition, embroidery needles will be helpful. I always use size 7 or 8, but use whatever you’re comfortable with. 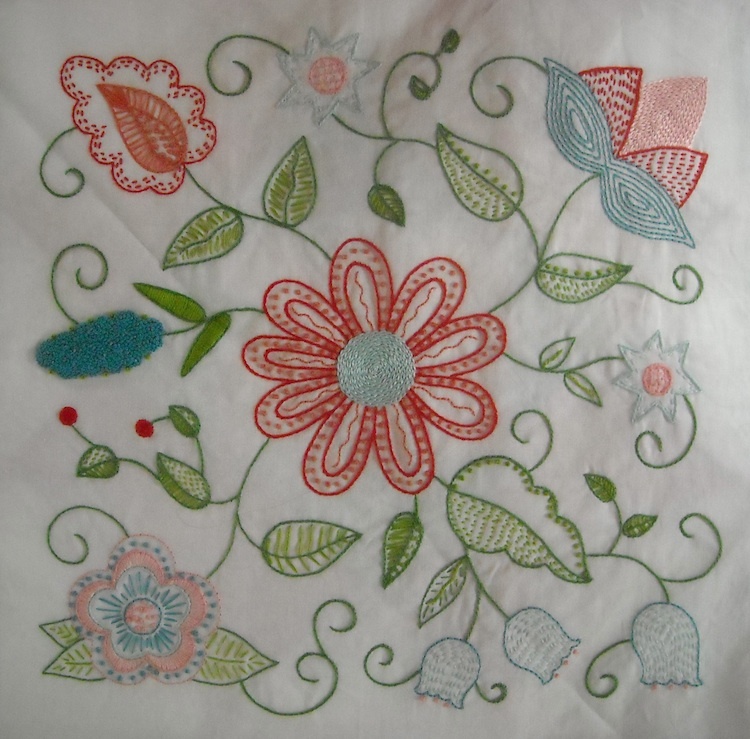 And finally, you’ll need a marking pencil to transfer the embroidery design onto your fabric background. Frixion pens work wonderfully for this, and come in a variety of colors, so you can pick one that you can see clearly. Does that give you enough to think about for a few days? Start gathering up your fabrics and tools, choose some floss colors, and if you have any questions at all, don’t hesitate to contact me and ask. I don’t want anyone to be confused. 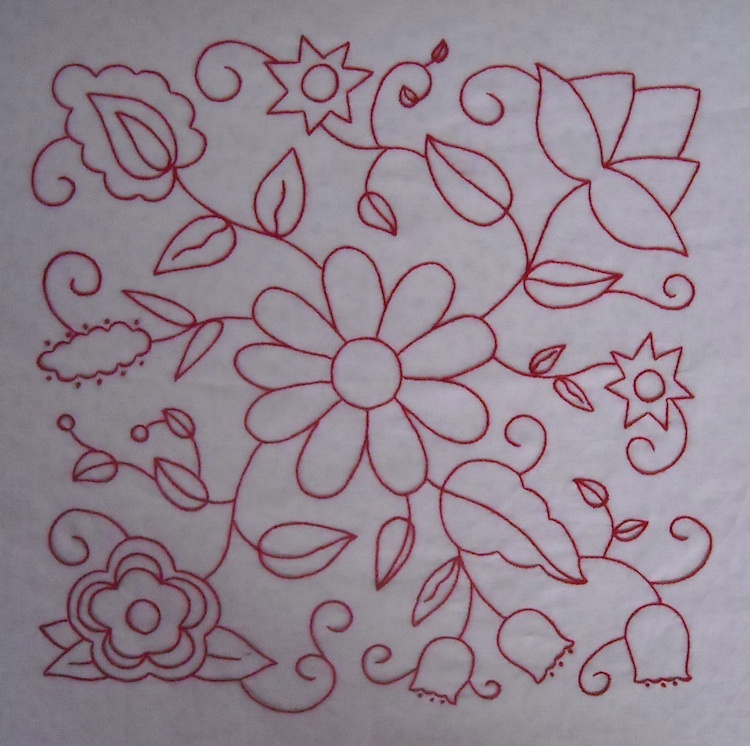 I’ll be back in a few days (possibly Friday) with the first embroidery block pattern and more information to go along with it. I can hardly wait to see some other versions of Hazel’s Summer Wildflowers! I just LOVE this, Shelly! It would be fun to do from all my Amanda scraps (i.e., from all her different lines! Thanks fo rthis! Do you put muslin or batting behind your stitcheries when you are stitching? That is just gorgeous! Love the blocks… so creative. I *just* found this QAL and I’m so excited that I’m not too far behind. I’m going to hopefully start stitching this weekend on Block 1!